The dotFIT Weight Management System was developed exclusively for the fitness environment and for people who truly understand that diets don’t really work and never will. With dotFIT the focus is on learning what foods work for you and how exercise changes your body and what you can eat; all coupled with guidance from your dotFIT professional. 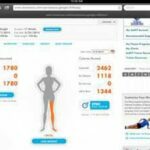 What is the dotFIT Program? The dotFIT Program is a comprehensive online fitness and nutrition plan. The exercise component is powered by the experts at the National Academy of Sports Medicine, and the food database is powered by CalorieKing. Using our proprietary Fitness Intelligence Technology, the dotFIT Program walks you through a short series of questions so you can create a fitness program integrated with a nutrition plan that is precisely right for you. It’s flexible, convenient and best of all—it works!